I have income from salary with HRA ( hra is exempt in form 16)& capital gain from stock market...so i have to fill ITR 2 ...So how can i show hra exemption in ITR 2??? I have a query that me & my husband working in a same pvt. company and living in a rented house. My husband used to claim HRA and submit rent receipt. But as our land lord didn't provide PAN no. so we claim HRA exemption only upto 1 lakh only. My question is that our employer had not deducted HRA this year (AY 2018-19) from Gross salary . She said that this year onward, HRA will be considered under 80C only. Please tell me if it is true as I have not read this anywhere? My another query is regarding tax exemption for House rent and home loan. As we are currently living in a rented house and paying rent. 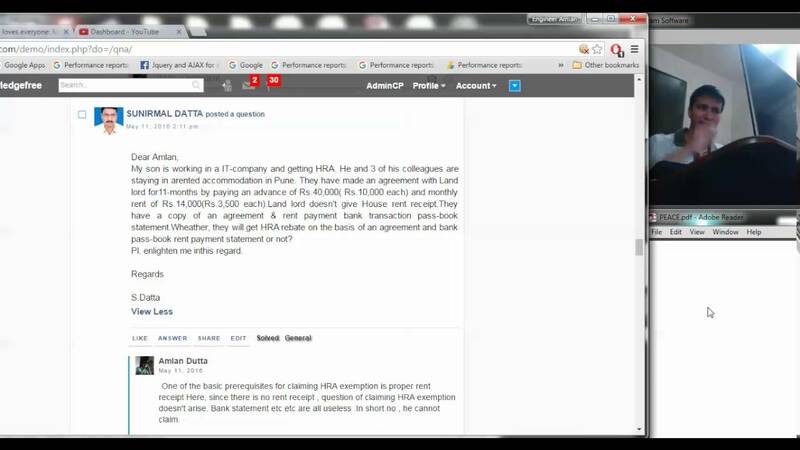 for HRA claim my husband had provided rent receipt and rent agreement to the employer. Now this year in February I bought a home in my name by taking home loan facility. Home loan is taken jointly (me and my husband). I recieved loan interest certificate for febraury and march 2018. I had not given these documents to my employer. I want to know can I or my husband claim home loan interest in ITR filing and in which section. Don't confuse between availing of HRA and claiming deduction benefit of loan interest on home HRA is a salary allowance under income from salary head Whereas loan interest is a eligible deduction while computing income from house property. However , in this case you cannot claim benefit of the loan interest since property is not ready yet . The benefit for loan interest is available for only ready properties u/s 24 b . But one thing you must realize that you can get HRA while staying in rented house and also claim loan interest benefit of the ready to occupy house( under income head "house property" ...Once house possession completed , you can claim benefit of prepaid loan interest in 5 equal installments subject to upper cap of 2 lakh rs per year. in AY 2018-19 ??? Or not show in this column?? My son is working in a IT-company and getting HRA. He and 3 of his colleagues are staying in arented accommodation in Pune. They have made an agreement with Land lord for11-months by paying an advance of Rs.40,000( Rs.10,000 each) and monthly rent of Rs.14,000(Rs.3,500 each).Land lord doesn't give House rent receipt.They have a copy of an agreement & rent payment bank transaction pass-book statement.Wheather, they will get HRA rebate on the basis of an agreement and bank pass-book rent payment statement or not? Pl. enlighten me inthis regard. One of the basic prerequisites for claiming HRA exemption is proper rent receipt Here, since there is no rent receipt , question of claiming HRA exemption doesn't arise. Bank statement etc etc are all useless .In short no , he cannot claim. Basically,if he is paying rent and getting HRA allowance every month, he is eligible for tax deductions according to the prescribed limit of HRA exemption.